Beige pure indian dupioni silk or raw silk fabric, made from pure silk yarn. Indian dupioni silk or raw silk fabric, mad..
Black dupioni silk or raw silk fabric, made from pure silk yarn. This is a very beautiful tone-on-tone Black Color. Indi.. Bright Magenta Pink silk or raw silk fabric, made from pure silk yarn. This is a very beautiful tone-on-tone Bright Mage.. Dark Turquoise Blue silk or raw silk fabric, made from pure silk yarn. This is a very beautiful Dark Turquoise Blue. Ind.. This iridescent silk dupioni fabric has a brilliant sheen and cross threads of Hot Pink and Black.The Dual tone of both .. Pure dupioni silk fabric , dupion silk fabric, Dupioni silk fabric By the Yard Light Cyan dupion silk fabric for weddi.. Pure dupioni silk fabric , dupion silk fabric, Dupioni silk fabric By the Yard Olive Green dupion silk fabric for weddin.. This iridescent silk dupioni fabric has a brilliant sheen and cross threads of Lavender and Black.The Dual tone of both ..
silk dupioni fabric, dupioni silk, dupioni, silk dupioni, silk fabricThis iridescent silk dupioni fabric has a brilliant.. This iridescent silk dupioni fabric has a brilliant sheen and cross threads of Mint and Gold.The Dual tone of both col.. This iridescent silk dupioni fabric has a brilliant sheen and cross threads of Green and Black.The Dual tone of both col..
Iridescent Pure dupioni silk fabric , dupion silk fabric, Dupioni silk fabric By the Yard Green dupion silk fabric for w..
dupioni silk fabric , Maroon dupioni silk fabric, dupion silk fabricThis iridescent silk dupioni fabric has a brilliant ..
dupioni silk fabric , Red Magenta dupioni silk fabric, dupion silk fabricThis iridescent silk dupioni fabric has a brill..
Dupioni silk fabric , Lilac Lavender dupioni silk fabric, dupion silk fabricThis iridescent silk dupioni fabric has a br..
Dupioni silk fabric , Peach Gold dupioni silk fabric, dupion silk fabricThis iridescent silk dupioni fabric has a brilli.. This iridescent silk dupioni fabric has a brilliant sheen and cross threads of Orange and Hot Pink.The Dual tone of both.. This iridescent silk dupioni fabric has a brilliant sheen and cross threads of Yellow and Black. The Dual tone of both c.. This iridescent silk dupioni fabric has a brilliant sheen and cross threads of Yellow and Red.The Dual tone of both colo..
Light Turquoise Blue silk or raw silk fabric, made from pure silk yarn. This is a very beautiful tone-on-tone Turquoise ..
Orange Pure Silk Fabric, Plain Silk Fabric, Pure Silk. This soft light weight silk fabric is absolutely beautiful!. The ..
Peacock Green Pure Silk Fabric, Plain Silk Fabric, Pure Silk. This soft light weight silk fabric has cross silk threads .. Pure dupioni silk fabric , dupion silk fabric, Dupioni silk fabric By the Yard Pink dupion silk fabric for wedding dress..
Indian dupioni silk or raw silk fabric, made from pure silk yarn. This is a very beautiful tone-on-tone Yellow. ndian du.. Pale Peach dupioni silk or raw silk fabric, made from pure silk yarn. This is a very beautiful tone-on-tone Pale Peach. .. This iridescent silk dupioni fabric has a brilliant sheen and cross threads of Green and Peacock Blue.The Dual tone of b..
Sea Green dupioni silk or raw silk fabric, made from pure silk yarn. This is a very beautiful tone-on-tone Sea Green. 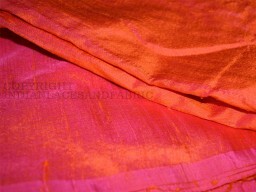 In..
Orange dupioni silk or raw silk fabric, made from pure silk yarn. This is a very beautiful tone-on-tone Orange. Indian d..
Grey dupioni silk or raw silk fabric, made from pure silk yarn. This is a very beautiful tone-on-tone Silver Grey. India..
silk fabric, silk dupioni fabric, dupioni silk, dupioni, silk dupioniIvory dupioni silk or raw silk fabric, made from pu..
silk fabric, silk dupioni fabric, dupioni silk, dupioni, silk dupioniPistachio Green dupioni silk or raw silk fabric, ma..
Red dupioni silk or raw silk fabric, made from pure silk yarn. This is a very beautiful tone-on-tone Red Color. Indian d..
Royal Blue dupioni silk or raw silk fabric, made from pure silk yarn. This is a very beautiful tone-on-tone Royal Blue C..
Spring Green dupioni silk or raw silk fabric, made from pure silk yarn. This is a very beautiful tone-on-tone Spring Gre..
Teal Blue dupioni silk or raw silk fabric, made from pure silk yarn. This is a very beautiful tone-on-tone Teal Blue Col..
Violet dupioni silk or raw silk fabric, made from pure silk yarn. This is a very beautiful tone-on-tone Violet Color. In..
White pure dupioni silk or raw silk fabric, made from pure silk yarn. This is a very beautiful tone-on-tone White, India..
Sheer White Pure Silk Fabric, Silk Fabric, Pure Silk. This soft lightweight Silk fabric is absolutely beautiful!.The fab..